Map Scale = 2″ to 1 mile; Printed on paper in 1990. 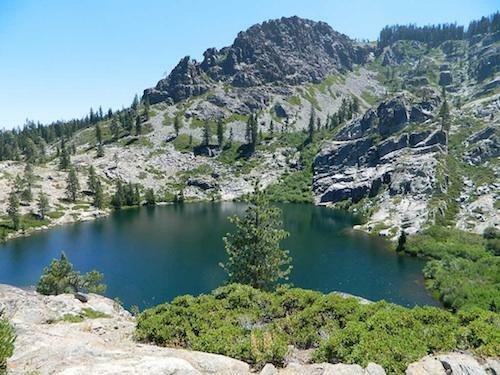 South of Mount Lassen, deep in the forests west of Quincy & Meadow Valley, lies a few small alpine lakes in and around the bigger Bucks Lake, a resort cabin community with dining, overnight lodging, cabin rentals, RV and tent campgrounds. Indian Rock is a popular DAY USE beach along the west shoreline. 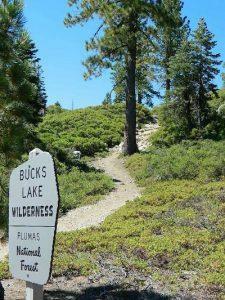 Wilderness hiking trails climb to peaks and lakes at higher elevations. Topo maps are perfect for a day hike reference or extended backpacking adventures. Pacific Crest Trail access. Bucks Lake has numerous developed campgrounds, smaller lakes and many miles of trails to explore. Caribou Wilderness, Ishi Wilderness, Thousand Lakes Wilderness are all featured on this topo map. Perfect for a day hike reference or extended backpacking adventures. Map Scale = 1″ to mile; Printed on waterproof plastic paper in 1997.